Gateshead in the 1980’s was a lifetime away from Belfast in the 1940’s – so why, as a young Geordie lad, did Mark Shepherd feel moved to leave a visual imprint of the Grand Old Team on a local gable wall? ‘What the bloody hell has Belfast Celtic got to do with a lad from the North-East of England?’ So asks Mark Shepherd, thirty years on since he neatly drew the words ‘Belfast Celtic’ in four foot letters on a gable wall on a side street of Sunderland Road in Gateshead. It was the early 1980’s, he’d just started school when a new kid with a strange, exotic accent walked into his classroom. Natural curiosity took over and the children gathered round the new boy, whose not-so-dulcet tones were recognisable from the nightly news bulletins reporting the place with all the soldiers and explosions. Mark was even more interested, as his relatives, like newboy John Miskimming, were Irish. Young John fitted in well and was soon friends with the whole class, his accent less and less out of place as time passed by. When groups of eight year old boys gather together in the soccer daft hotbed of the ‘great north east’, football will never be far from the conversation and so, naturally, one day, chat turned to teams and titles. Probably the most important question a young lad will be asked is simply ‘What team do you support?’, because as everyone knows, once you’ve picked a team, it’s yours for life. Wives, houses, cars, jobs – all these can change – but it’s a total heresy to change your football side once you’ve made the cardinal choice. As the question rolled of one of the child’s lips, the answers soon returned – Newcastle, Liverpool, Sunderland, Manchester United and Mark, proud as punch and with a nod to his roots, replied ‘Celtic’! One lad however, was quiet, and after prompting, John Miskimming replied; “Our team died”. What? Football teams don’t die. In the minds of tiny children in the early Thatcher years, football clubs were evergreen - Newcastle United had been around since ships were built on Tyne and Wear and coal was dug in Durham. But John explained the riot which finished his Grandad’s team, the player with the broken leg and the others in the hospital. Some of the kids refused to believe the story – it was too farfetched, too shocking to be true. A few years later, Mark Shepherd had entered secondary school and, as the apron strings loosened, the school friends began visiting each other across town. One of the biggest days in his life came when his parents purchased his first ever Celtic strip – a huge deal in the life of a fan, years before repli-kits available at Sports Direct or online at Kitbag. Mark wore his hoops proudly in a sea of Black and White during the days of ‘Keegan Mania’ as the Magpies were brought to the cusp of returning to Division 1 of the English leagues. Across town, as he knocked on the door of John Miskimming’s home, Mark was told that John was at his grandad’s house, as he’d recently also moved from Belfast with his wife, so off he toddled, knocking the second door in the hunt for his pal. Out came John’s Grandma and a standoff ensued – as neither could understand a word the other was saying – the woman with her accent as thick as Belfast treacle and Mark with his Geordie accent as deep as the Tyne. Thankfully, John appeared and set about translating, switching effortlessly from a Belfast accent to a Geordie one to get things moving in the right direction. Soon, the two lads were at the back of the house helping the grandparents with their unpacking. On seeing the Hoops glimmering on the child’s back, John’s granddad immediately said ‘Ah, yer a Celtic man, are ye? So whose your favourite player then?’ Mark quickly relayed that, because of his silky skills and similar hair colour to his father, Tommy Burns was that man. He’d recently replaced Charlie Nicholas in the young lad’s affections since Champagne Charlie had buggered off to Arsenal! “Aye son”, said John’s granda, as he then gave the two nippers a potted history of Belfast’s grand old team, including the fateful day at Windsor Park in 1948. Mark was transfixed and horrified in equal measure. Words were used that he’d only ever heard on the news, in relation to trouble in the north of Ireland. He couldn’t believe Jimmy Jones had been tossed over a wall and stamped on so violently by an angry crowd that his leg was smashed – his heart went out to him. Mark recalls; “I can remember saying, ‘Ya divint do that to players man, no matter how much yar ‘ated them”. But the conversation wasn’t all doom and gloom, as the old man regaled the lads with tales of the famous win against Scotland in America, which allowed the Belfast Celtic to leave football on an all-time high! Both lads were completely blown away and, within minutes, they were in the street with a football pretending to beat the top players Scotland had to offer, mimicking granddad’s heroes. On the paper round one early morning, Mark passed some houses the council were in the process of repairing. As he turned a corner, something caught his eye and protruding like the sword in the stone was a bucket of white paint and a brush! Like most young lads, Mark found this temptation very hard to resist; “I took the paint brush and pondered writing my nickname, but I knew that was pretty stupid as this was also my surname. “So I thought, ‘I’ll write Celtic’, but again, I’m the only hoop in town – I’ll be caught!” So then it came to him; “Why not paint Belfast Celtic?’ – It was mini-mischief, but a mini protest, some way, a small way, of bringing the team back – if in name only! 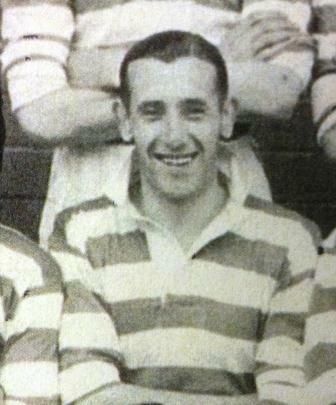 He moved closer to the wall and made his mark – in letters four foot high roared the legend BELFAST CELTIC. That slogan, tidily and carefully written, rang out from that Gateshead gable end until the house itself was pulled down over a decade later. Later in life, Mark joined the Tyneside No1 Celtic Supporters club in the early 90's, a full blooded travelling Celtic fan and visiting Scotland week in, week out to follow the hoops, infrequent wages or dole money permitting. The Celtic bug had truly bitten and Mark began to research the club and a leaf through Padraig Coyle’s history of the club, ‘Paradise Lost and Found’, soon through up a big surprise!“I was reading that great book’, remembers Mark, “When a name just stood out! Jimmy Turnbull, a successful player from the 30’s, whose hometown was Gateshead. “I couldn’t believe it, I thought, “Yes! My hometown has a proper link with this great club and he was one of their greatest ever players!” Turnbull was fast – a lightening striker who lit up the Irish scene at Belfast Celtic and later Cork City, who began his sports life as a champion sprinter. Mark remains interested in the history of Belfast Celtic and was keen to share his story with the Belfast Celtic Society. Still a full-time Celtic support, the old Belfast club is never far from his mind, as he explains; “A few weeks ago £168 million was won on the lottery. “I thought to myself, ‘What could i do with £168 million? “Could or should I bring back Belfast Celtic back to life? After thinking about i thought no."